Therizinosaurus is a genus of very large theropod dinosaurs，which lived in the late Cretaceous Period (late Campanian-early Maastrichtian stages, around 70 million years ago), and was one of the last and largest representatives of its unique group. The most distinctive feature of Therizinosaurus was the presence of gigantic claws on each of the three digits of their front limbs. Their forelimbs may have reached lengths of up to 2.5 metres (8.2 feet) or even 3.5 metres (11.5 feet) in the largest known specimen. In 2010 Gregory S. Paul estimated the maximum size of Therizinosaurus at 10 metres (33 ft) in length and five tonnes in weight.They are the largest therizinosaurs known, and the largest known maniraptorans. Childhood is a time of dreams and adventures, these dinosaurs helping younger and older children creat their own Jurassic World with their own imagination,which will help them develop and discover the world around them. 4,Great way to get feel of ancient world and an extinct species Well-balanced and stable design represents nature's unique creation that helped balance the weight through strong thighs and long tail. 1,Material：Made of high quality solid plastic,non-toxic, odorless and non-allergic,Safe for kids. SAFE & ENVIRONMENTAL MATERIAL - Made of high quality plastic; solid, rugged, heavy duty and drop-resistant.Also eco-friendly and non-toxic,SAFE enough for kids. This dinosaur with an articulated and movable jaw plays a running pose which provides you with a realistic experience in Jurassic World. CREAT THEIR OWN JURASSIC WORLD,DEVELOPS DEXTERITY AND SPARKS IMAGINATION - Encourage your kids to use their imagination to create their own magical kingdom. This toy will help to develop their skills while enjoying hours of imaginative play in great planet's history. VIVID FIGURE,AMAZING DETIAL - It is hand painted with amazing detail. 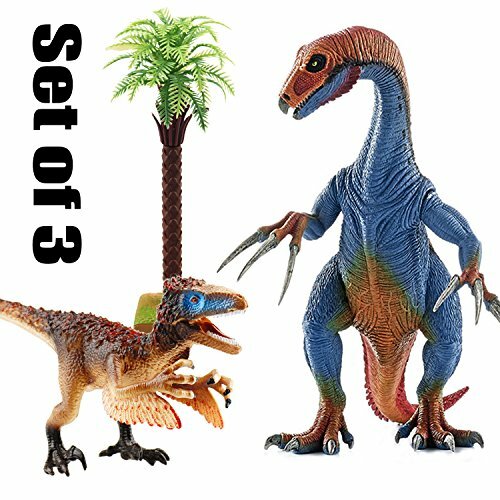 You Can See the body proportion,skin texture,Crinkles,jaw, eyes or tail - everything is realistically detailed,which gives the impression that the figurines are animated,realistic, educational. IDEAL PRESENT FOR DINOSAUR LOVERS: this figurine is suitable for a range of interests, including collectors, teachers,and kids. Just right for a school / science project or report.Great Gift for Christmas, New Year, Kids Birthday and Festival and Meeting with Children. 100% GUARANTEE - your satisfaction is our goal. If you meet any product problem, please don't hesitate to contact us, and we will offer you satisfied solution by sending you a new one or return full refund per your request. NOTE - Small parts included, NOT for children under 3 years old. Our service email is service@bootaa.com. If you have any questions about this product by BooTaa, contact us by completing and submitting the form below. If you are looking for a specif part number, please include it with your message.